What does it take to be an effective leader? Can we learn to lead? What does it take to improve leadership in individuals and throughout organizations? If you’re a student of leadership, you know these are among the central questions for both research and practice. 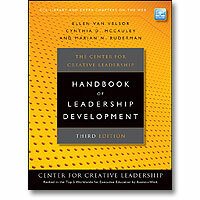 In the new edition of The Center for Creative Leadership Handbook of Leadership Development, these issues are explored and explained. Editors Ellen Van Velsor, Cynthia McCauley and Marian Ruderman have blended 40 years of research and knowledge with new perspectives and emerging directions in the third edition of the book, released this month. The book offers a solid view of how managers learn, grow, change and lead throughout their careers — not just from formal programs but also from the challenges in their working and nonworking lives, the relationships they cultivate and the adverse situations they encounter. Although written with human resources and organizational development professionals in mind, practicing managers and leadership “fans” will appreciate the window into CCL’s thinking and practices. The Introduction alone is packed with information: CCL’s model of leader development; underlying assumptions; an overview of what develops in leader development; and methods for enhancing the development process. The book also distinguishes leader development from leadership development, reflecting CCL’s growing interest in developing collective capacity for leadership. “We have come to understand leader development as one aspect of a broader process of leadership development,” the editors explain. Written to present CCL’s knowledge in a way that is both conceptual and practical, the book can stimulate thinking about your own development — and be used to create development experiences and design leadership development processes for others. CCL’s understanding of leadership development is deeply grounded and ever-evolving. In each edition of The Center for Creative Leadership Handbook of Leadership Development, we update readers on both a core knowledge base and the new directions our work is taking. The just-released third edition differs significantly from the second in four main ways. New chapters—some completely new in topic and some that are new interpretations of topics presented in earlier editions. For the first time, it has chapters on leader development in the education sector, developing leaders in times of transition, democratizing leader development, developing teams, developing globally responsible leadership, developing strategic leadership, and developing intergroup and interdependent leadership. Greater emphasis on developing leadership as an organizational capacity. With five chapters devoted to the topic, we show depth and evolution of our thinking about developing leadership capacity at an organizational level. An integrated approach to global leadership issues. In the past five years, we have started conducting more research and programs in Eastern Europe and Russia, Africa, India, Singapore, China and elsewhere around the world. So in this third edition, we have tried to capture our wider awareness by dropping the two discrete chapters on global leadership and cross-cultural issues in favor of including knowledge about global and cross-cultural issues in nearly all of the chapters. Additional Web site content. A dedicated Web site contains files with downloadable versions of chapters from previous editions and other related materials we believe readers will find of interest. Government: All talk and no action?